Former University of Houston head basketball coach from 1956-1986 Guy V. Lewis (Houston) was inducted into the Naismith Memorial Basketball Hall of Fame on Sunday, September 8th. Lewis was popularly remembered as the coach of the famous Phi Slama Jama dynasty of the 1980s that featured Clyde Drexler and Hakeem Olajuwon. Brother Lewis of Arp, Tx. won 592 games, and led the Cougars to five Final Fours and 14 NCAA Tournament appearances. Lewis was joined at the Naismith Memorial Basketball Hall of Fame by former Houston greats and fellow Hall of Fame inductees Elvin Hayes, Hakeem Olajuwon, and Clyde Drexler. In a recorded address, Elvin Hayes spoke on behalf of Coach Lewis and praised his influence. “I had a dream that I would be one of the greatest basketball players that ever lived… [Coach Lewis] just truly embraced me and made me a great player and made my dreams come true,” said Hayes speaking about Lewis. In March of 2013, The Board of Regents of the Texas State University System named Kenneth R. Evans (Cal. Davis) the president of Lamar University. Evans was selected from amongst 70 other applicants. On July 1, 2013 Evans took office. Dr. Evans served as the dean of the Michael F. Price College of Business at the University of Oklahoma, a position he held since 2007. Previous experience saw him in a variety of teaching, administrative, and research positions at the University of Missouri, Arizona State University, University of Colorado, and California State University, Sacramento. Following the premier of the ESPN Films documentary, The Book of Manning, the University of Mississippi announced that once renovations are completed on the school’s football indoor practice facility, it will be named the Olivia and Archie Manning Athletics Performance Center. The Manning Center is scheduled to open in early 2014 and will feature a full kitchen and dining hall that will be open to students, faculty and staff members. The facility will also provide a nutrition center for all Ole Miss athletes, an expand weight room, and increased seating in the team meeting room. The renovations have been paid for as part of the university’s Forward Together Campaign. The Manning family made a sizeable contribution to help provide for the renovations. Archie (Mississippi) and Olivia met while attending the university. The Mannings are currently recognized at the university in several ways, including the campus speed limit set at 18 miles per hour- -Archie’s football number, and Manning Way, the road around several athletic facilities on campus that posts a speed limit of 10 mph, Eli’s (Mississippi) jersey number. Clyde I. James (Morehead State) was awarded the 2013 Founders Award for University Service this year by Morehead State University. James, who worked for Morehead State for 27 years, served as residence hall director, faculty member, associate dean of students, Greek affairs director, and manager of the university center. 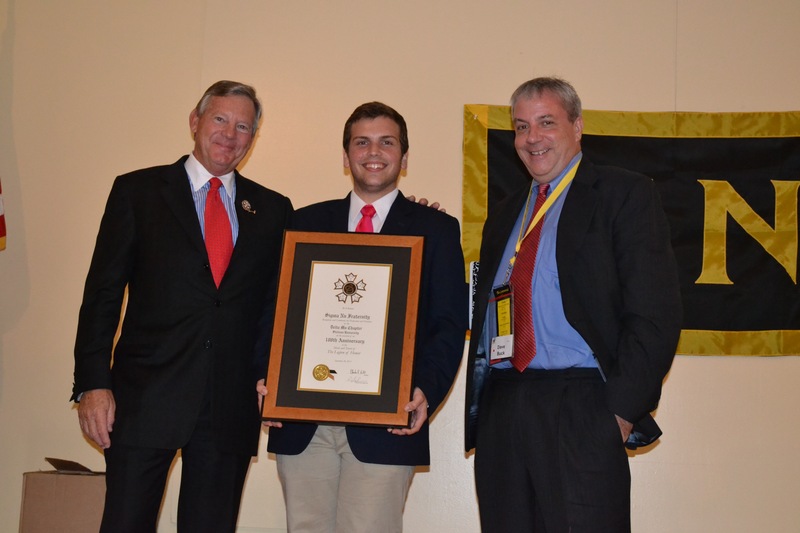 Brother Clyde I. James (Morehead State) was presented the 2013 Founders Award for service to Morehead State University. Brother James served as advisor to the Theta Tau Chapter of Sigma Nu at the time of its formation and was initiated as a charter member. A native of Morehead, James is a graduate of Morehead High School and MSU. He received his master’s degree in education administration with an emphasis in business from Indiana University. Since retiring, James has continued to serve Morehead State as a volunteer. 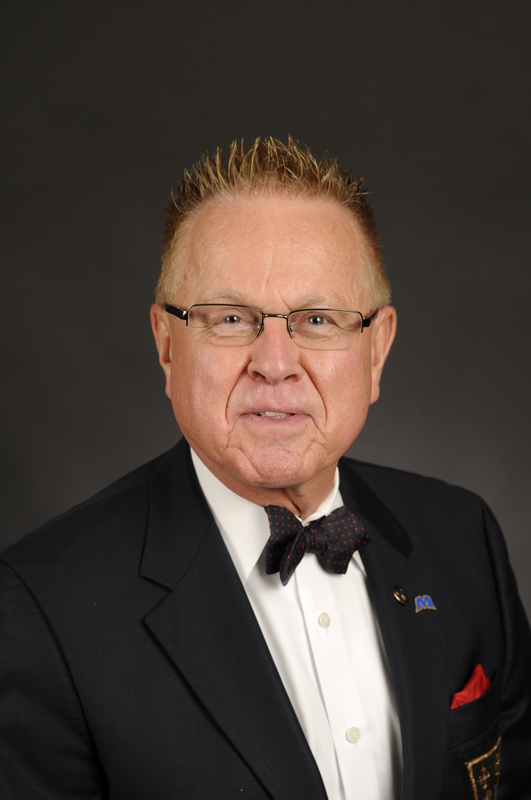 James has served as a goodwill ambassador and as president of the MSU Alumni Association. In addition, the university announced that $25,000 has been donated to establish the Clyde I. James Scholarship Endowment to provide scholarships for future students. Molinar was selected for the summer tennis team along with eight other athletes. Unlike other countries, the United States’ Deaflympic athletes raise all of their own funds to travel. To fund the trip Molinar was required to raise $5,000 which he did through the help of his parents, the United State Tennis Association, and his Zeta Psi chapter brothers. The inaugural Deaflympics was held in 1924 and this year’s games featured athletes from 71 nations. Team USA was able to claim 9 gold, 8 silver, and 12 bronze medals. 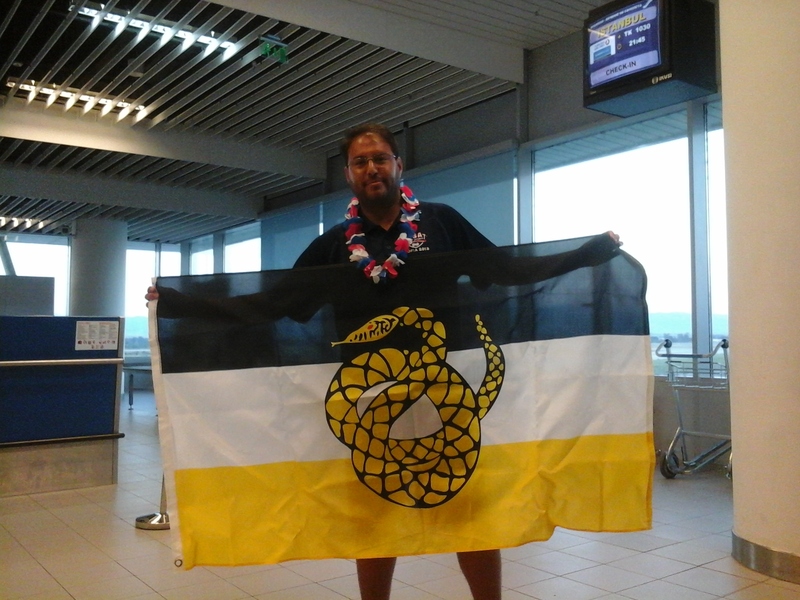 Alumnus Javier Molinar (Lamar) traveled to Sofia, Bulgaria to compete in the Deaflympics on behalf of Team USA. John Hursh (Wyoming) was recently spotlighted in the publication Wyoming Lawyer for his work with military veterans returning to college. Brother Hursh has created a partnership with the University of Wyoming and the Wyoming State Bar to offer pro bono work for veterans to maximize the amount of benefits they receive from the U.S. government. For Brother Hursh’s work he was awarded the ABA Military Pro Bono Project Outstanding Services Award. Brothers from the active and alumni chapters gathered on the weekend of September 13-14 to celebrate the 50th anniversary of the chartering of Eta Nu Chapter at the University of Louisiana at Lafayette. The event began on the evening of the 13th with a reception at the historic Jefferson Street Pub. The following morning was dedicated to a brunch at the Petroleum Club of Lafayette in which several addresses were given by special guests, alumni, and brothers of the chapter. Alumni Chapter President Dan Hare began the brunch by welcoming all in attendance. The welcome was immediately followed by a prayer from Father Bryce Sibley of Our Lady of Wisdom Catholic Church and Student Center. The prayer led into a memorial for the brothers from Eta Nu Chapter who have entered Chapter Eternal. University of Louisiana President Dr. E. Joseph Savoie and Assistant Dean of Students Tucker Sappington were also present to share their congratulations to the group. Dean Sappington thanked the alumni for their legacy on the campus and enthusiastically encouraged them to return often to celebrate their fraternal fellowship. He also complemented the active chapter and acknowledged the chapter’s leadership. Commander Douglas Fournet gave an endearing state of the chapter address to all in attendance. He then assisted Hare in presenting white roses to the chapter’s former and current White Roses (sweethearts) and introduced the past Eta Nu Chapter Commanders that were in attendance. Division Commander Jeremy LaCombe addressed the group and encouraged it to continue to strive for excellence. He then congratulated the chapter on its 50th anniversary and presented a framed and matted certificate to commemorate the auspicious occasion. Former Grand Treasurer, Vice Regent, and Division Commander Austin Landry, an Eta Nu initiate, expounded upon Brother LaCombe’s words and reflected on his treasured experience as an Eta Nu and expressed his hope that the chapter would continue to set the standard at the University of Louisiana. Closing remarks were provided by Dan Hare and he congratulated Dr. Michael Judice, an Eta Nu initiate, as the new UL Alumni Association president and the first Eta Nu to serve in that volunteer position. 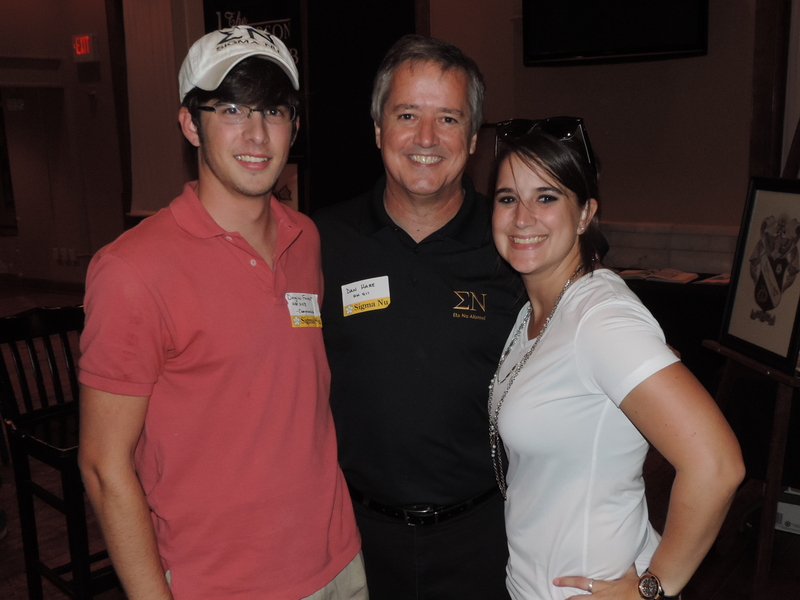 He encouraged membership in the University of Louisiana Alumni Association which the Eta Nu Alumni Chapter has forged a partnership with and provides dual membership to both organizations. The weekend coincided with the first home football game for Louisiana’s Ragin’ Cajuns and the active chapter hosted an open house on Saturday afternoon. Tailgating activities were abundant at nearby Cajun Field where a congratulatory message to the chapter flashed repeatedly throughout the game on the scoreboard’s marquee. On September 28th, the Delta Mu Chapter of Sigma Nu Fraternity celebrated their 100th anniversary at Stetson University. To commemorate the historic occasion, the chapter brothers and alumni leaders held a banquet in which over 250 brothers, alumni, parents, and friends of the chapter came and celebrated. The evening began with a cocktail reception in which the attendees of the banquet were treated with recognition of the chapter by Stetson University President Dr. Wendy B. Libby. Dr. Libby’s remarks focused on her appreciation of the chapter’s accomplishments and support of the university’s mission. Concluding her remarks, Dr. Libby was presented with a plaque of recognition from the High Council of Sigma Nu by Regent Charlie Eitel. Alumnus Bill Watson then awarded President Libby an 1883 Silver Morgan Dollar – – the year of Stetson’s founding – – as a gift from the Delta Mu Chapter for her support of the Greek system and the chapter. After the cocktail reception, Alumni Advisory Board Chairman Bill Heim formally welcomed the guests to the banquet and thanked all in attendance on behalf of the chapter for their support of the chapter. Brother Heim invited Brother David Hill to the front to give the invocation prior to dinner. Following dinner, Regent Charlie Eitel addressed the banquet and encouraged the chapter to continue in their pursuit of excellence and to continue to support the mission of Sigma Nu. Regent Eitel also congratulated the chapter on its 100th anniversary and then presented chapter Commander, Gage Reed with a plaque recognizing the chapter. Reflections on the chapter were given by chapter alumni David Buck, Bill Watson, John Fischetti, and Sam Rabin. Fond memories and witty anecdotes were exchanged about their undergraduate days and each brother encouraged the chapter to continue to strive for excellence.